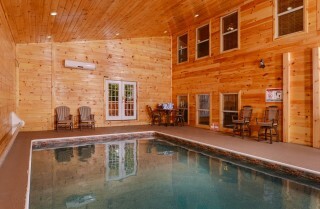 Buckskin Lodge is not only the perfect accommodation for your next couples’ retreat, holiday family gathering, or destination wedding, but also the Smoky Mountain vacation everyone will brag about because of all the awesome amenities of an indoor pool, beautiful wooded mountain views, and a private theater room! 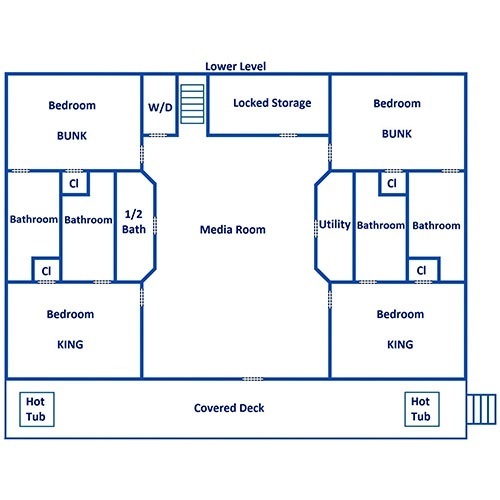 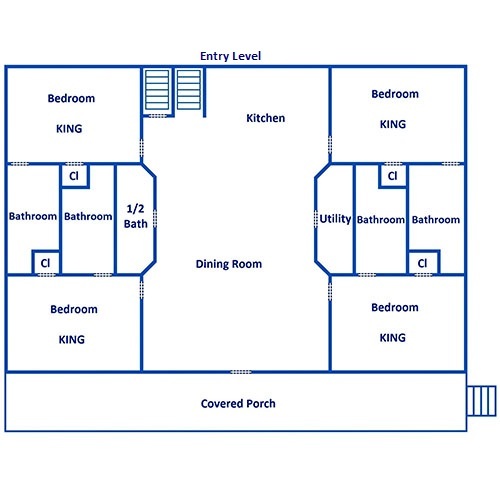 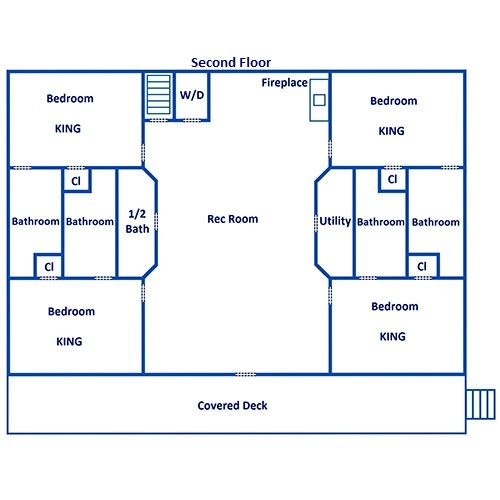 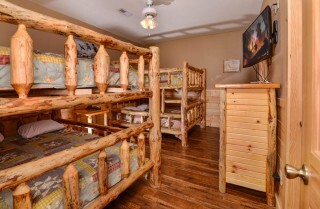 Sleep up to 44 guests across 3 levels, with 12 bedrooms, 10 king-size beds, 4 queen bunks, and 4 queen sleeper sofas. 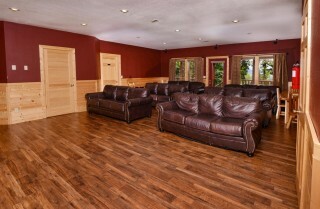 You can spread out and never feel cramped while still enjoying the company of friends and family. Rainy days and downtime in the cabin mean more time to enjoy the company and fellowship of friends while swinging on the porch swings, relaxing in the outdoor hot tubs, and sharing recipes in the spacious kitchen. While days in the cabin are incredibly fun, you came to the Smoky Mountains to explore all the gorgeous nature and excitement of Pigeon Forge and Gatlinburg! Group discounts to awesome attractions like Dolly Parton's Stampede, the Gatlinburg Space Needle, and Foxfire Mountain Adventure Park make having fun with the group even more affordable. 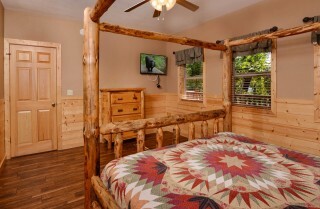 And don’t forget the Cabins for YOU partner program, which boasts discounts to top area attractions when you stay with us! 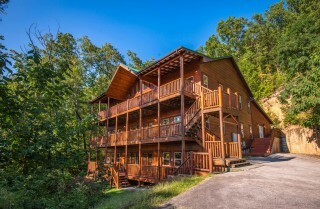 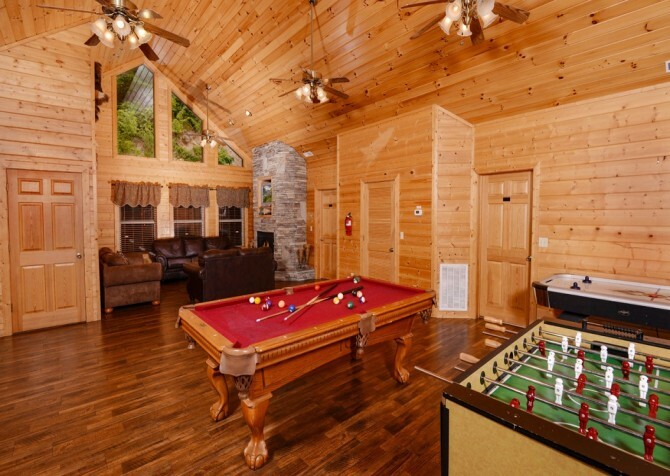 Situated conveniently in the mountains just a short drive from downtown Pigeon Forge and Gatlinburg, Buckskin Lodge makes coordinating excursions into town easy, once you convince everyone to get off the cozy couches and out of the awesome game room! 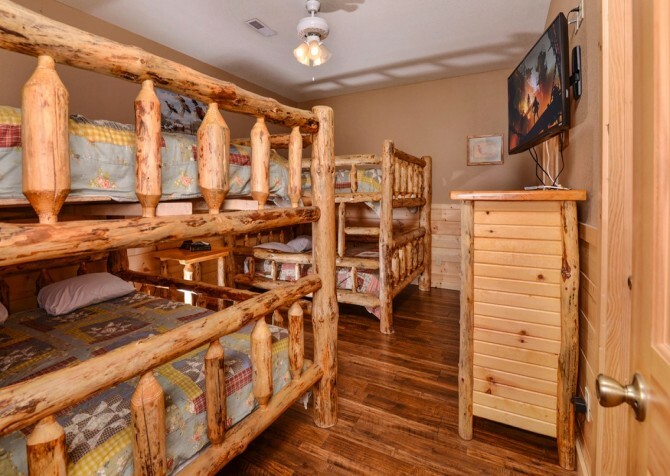 Whether you’re here with a group of kids or adults – or a mix of both – it will be easy to find plenty to do at the cabin and in town! 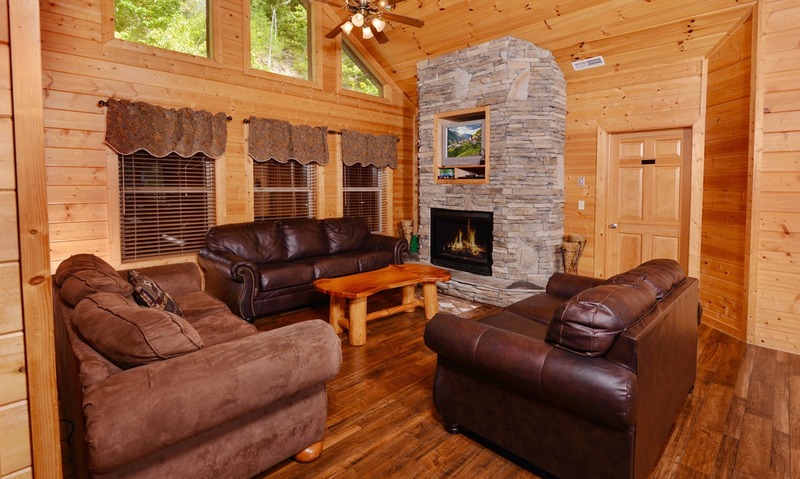 You and your fellow guests will love spending time catching up while lounging around the living room on three cushy couches while the large stone fireplace warmly lights the room with an inviting fire in the evenings. In the afternoon, swap stories of your morning’s adventures while you watch TV and unwind. 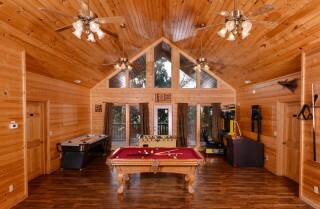 It’s also the perfect place to swap gifts for the holidays or bust out the cards and play some games! While the adults drink and talk in the living room in the evenings, teens and kids will love goofing off and playing in the nearby game room! Shoot some pool on the full-size billiards table while waiting your turn at the racing arcade game. 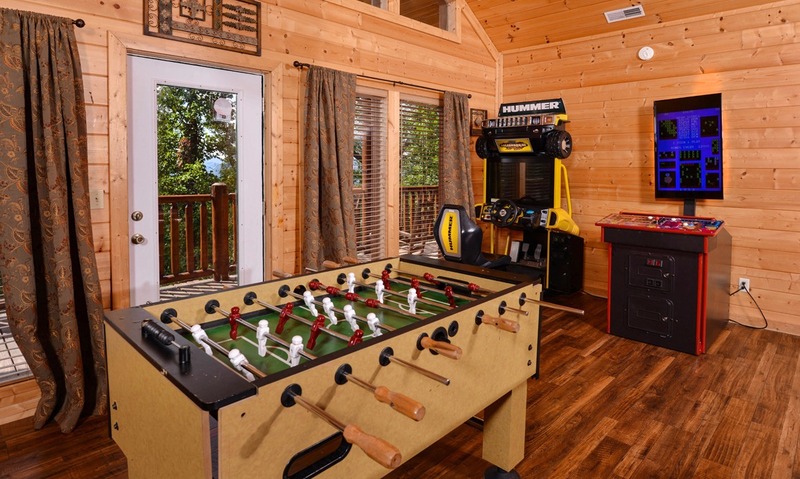 Try your hand at the old-school arcade game with a modern flatscreen or work up an appetite from playing air hockey in this fun space! 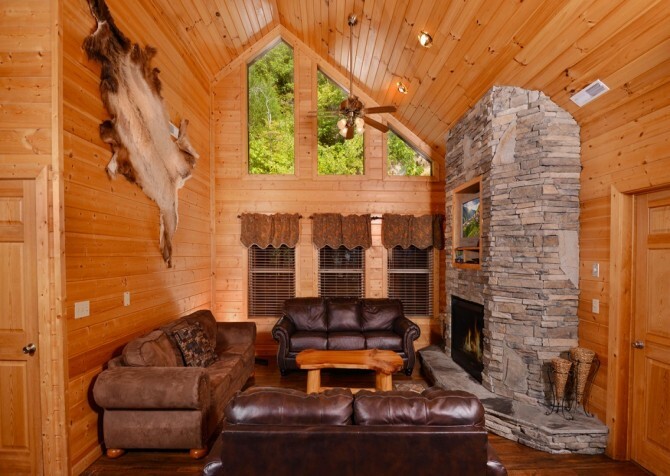 With floor-to-ceiling windows and rich wood all around, it’s the perfect blend of warm and bright. 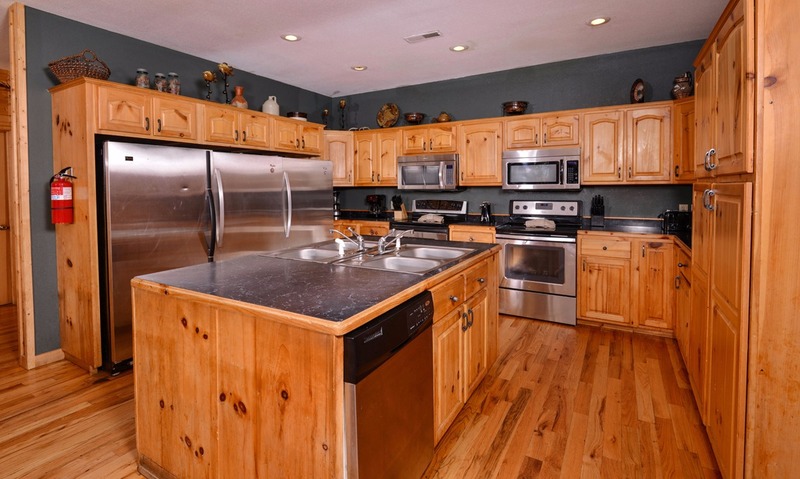 No need to fear large meal prep while staying in Buckskin Lodge, because this gorgeous kitchen has every appliance doubled up! 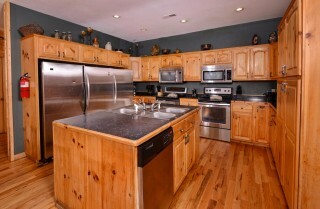 Team up to cut vegetables on the large kitchen island while the sauces and pasta cook on the 2 electric stove tops. 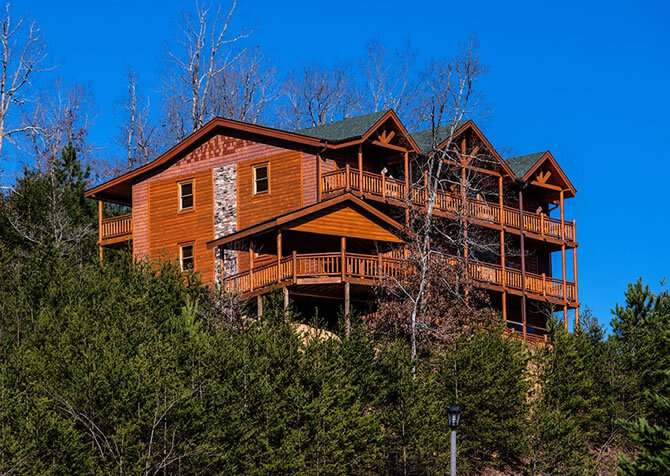 Laugh and sip on wine from your Rocky Top Wine Trail tour to keep the cooks company as they move from each stainless-steel appliance to the next. 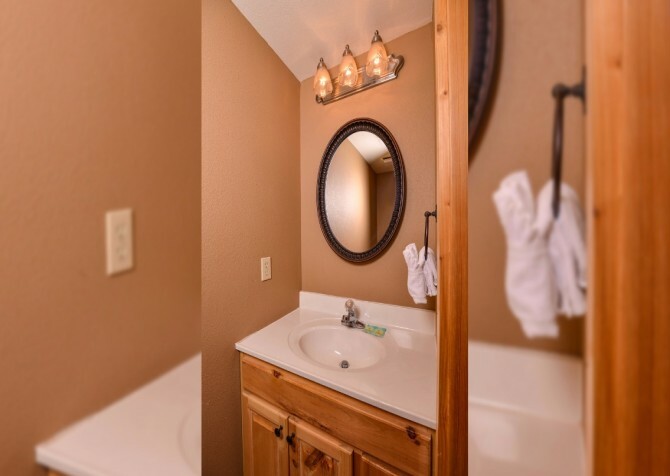 Before the meal is ready to set out for a giant buffet, pull dishes and serving utensils from the charming wooden cabinetry, conveniently stocked for your group’s use. After late nights spent laughing and conversing on the deck, come back to the kitchen to snag your leftovers from the refrigerator to reheat in the microwave for a quick midnight snack! 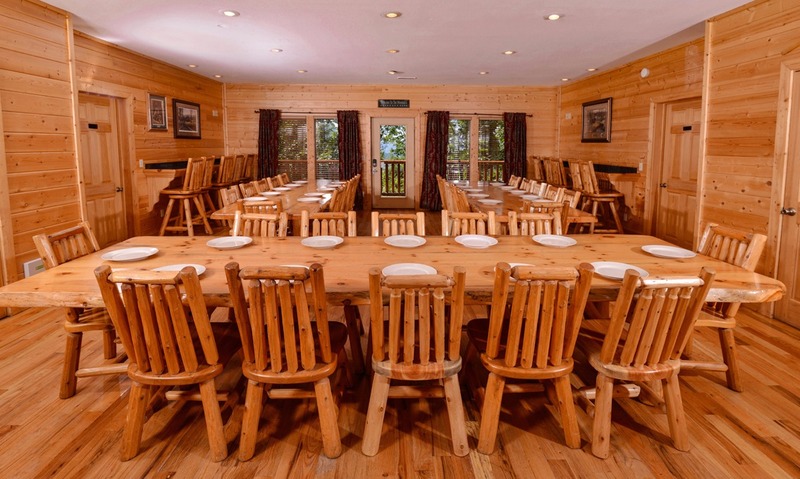 With charming log seating positioned around 3 long wooden dining room tables, and bar seating by the windows, there is room for all 44 guests in the spacious, oversized dining room of Buckskin Lodge! 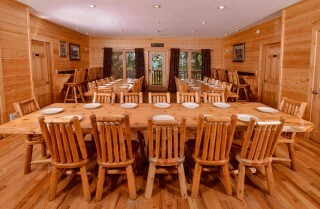 Pass dishes of mashed potatoes, mac ‘n cheese, and biscuits along the table as you chat and laughter fills the cabin. Stand and make a toast from your seat to the happy newlywed couple while caterers from Savory Solutions by Chef Jeremy take care of every step of the meal. The bar seating against each wall also make for excellent self-serve buffet areas for holiday family meals or game days when extra seating is not necessary! 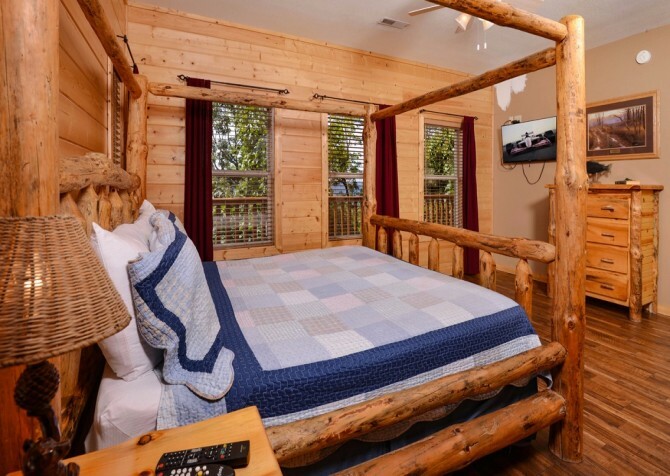 Escape to your bedroom for an afternoon nap or some quality time to yourself after returning from a group hike to Clingmans Dome. 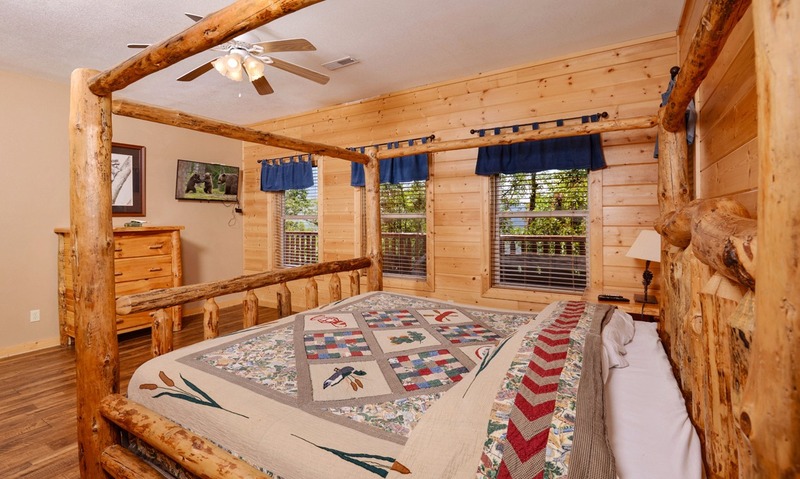 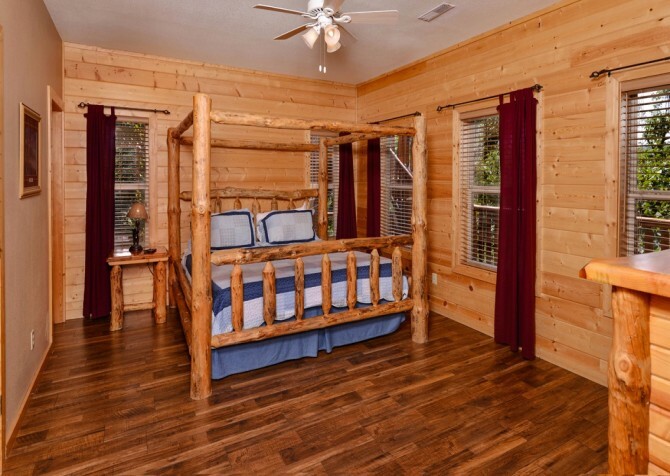 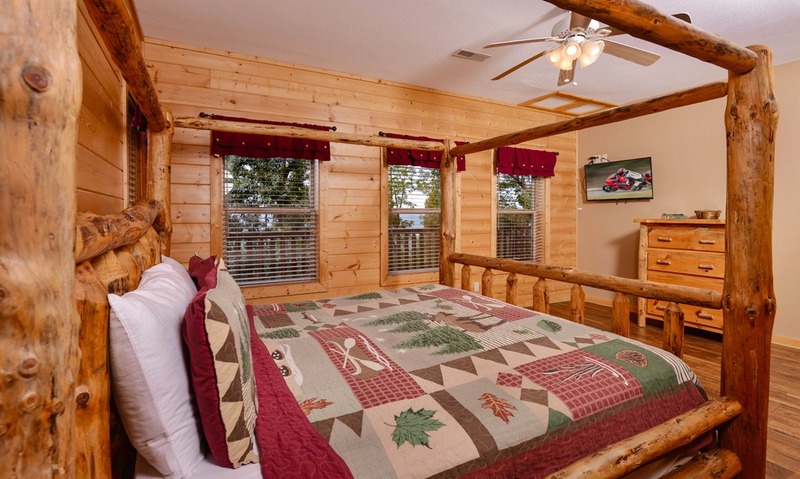 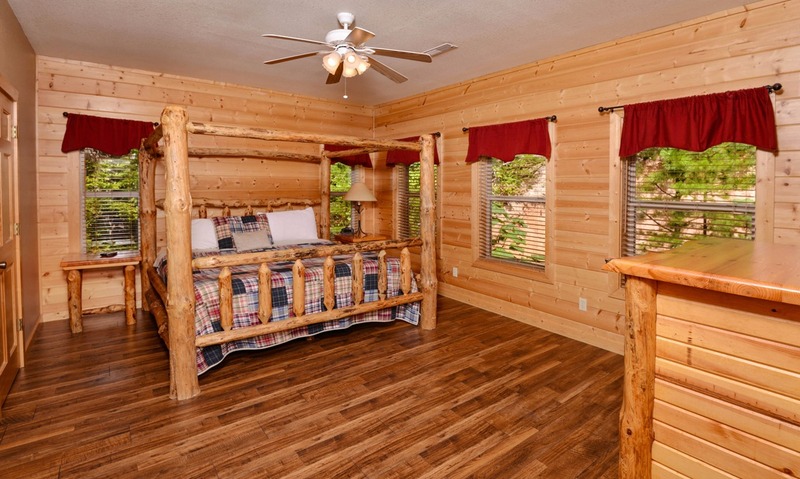 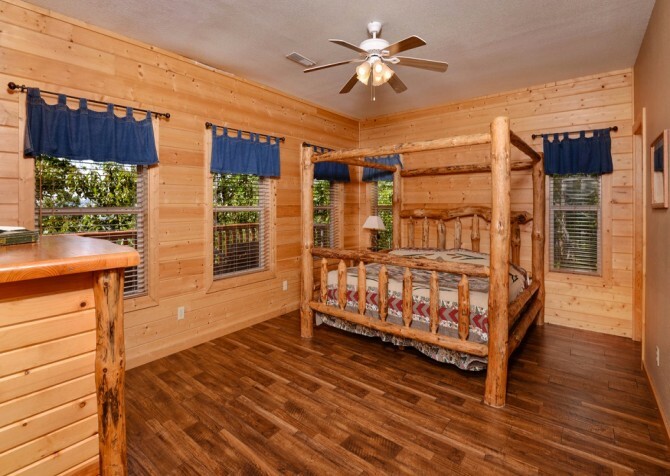 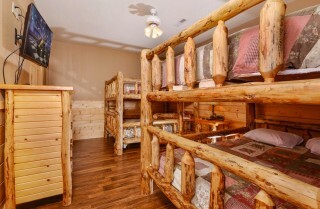 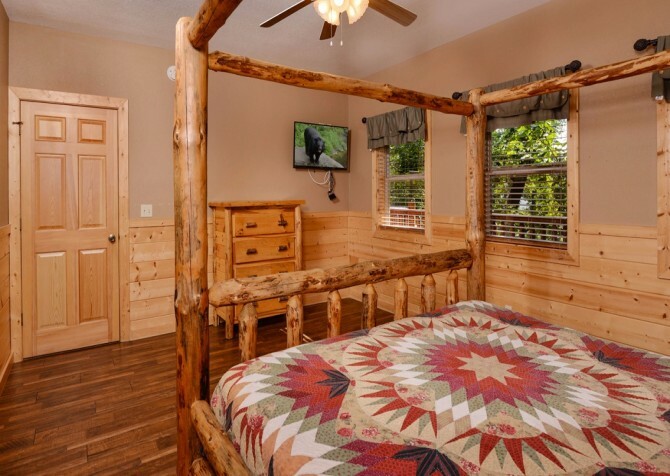 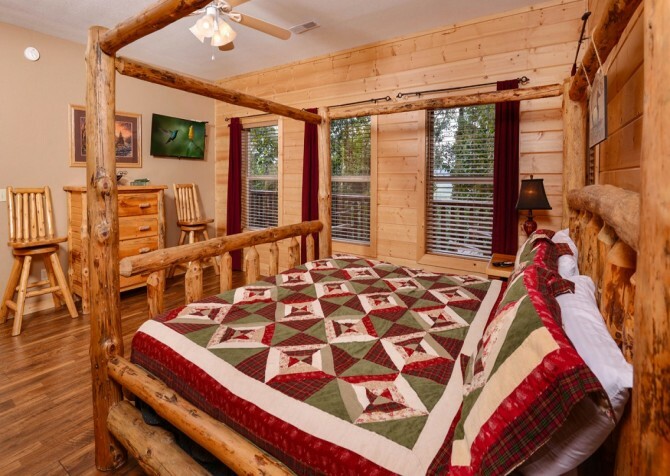 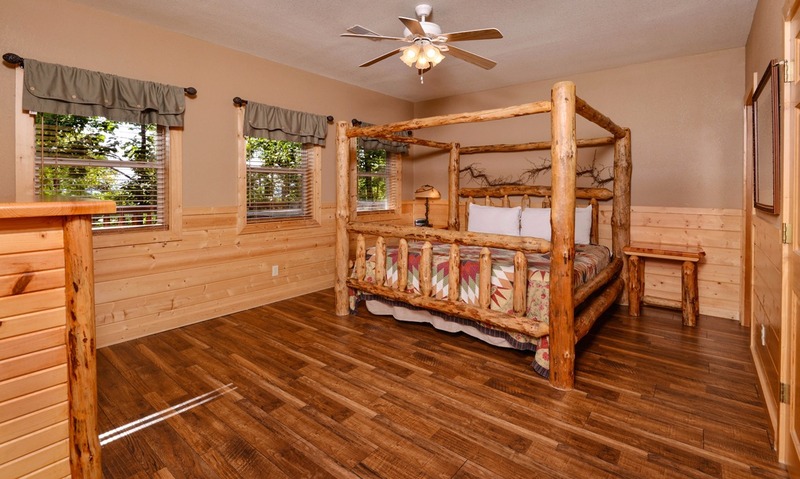 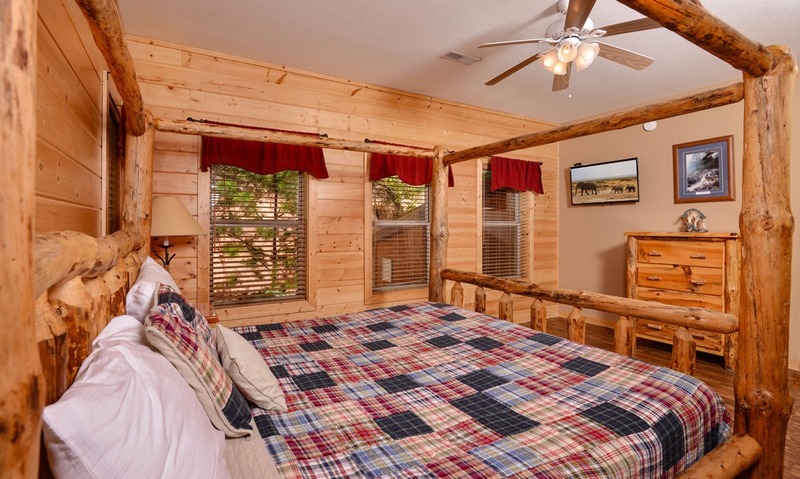 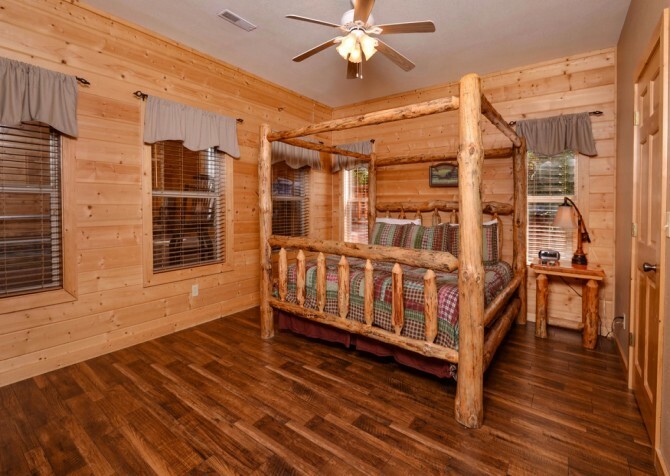 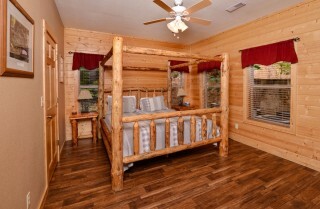 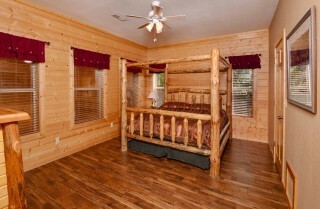 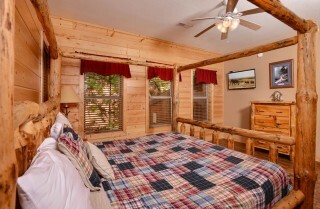 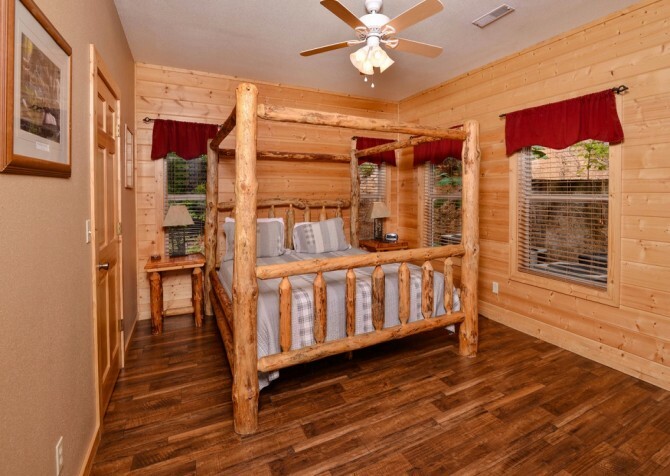 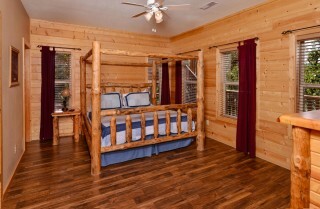 Beautiful log bed frames and homey, mountain-motif furnishings invite every guest to relax and unwind after full, exciting days in Pigeon Forge and Gatlinburg. 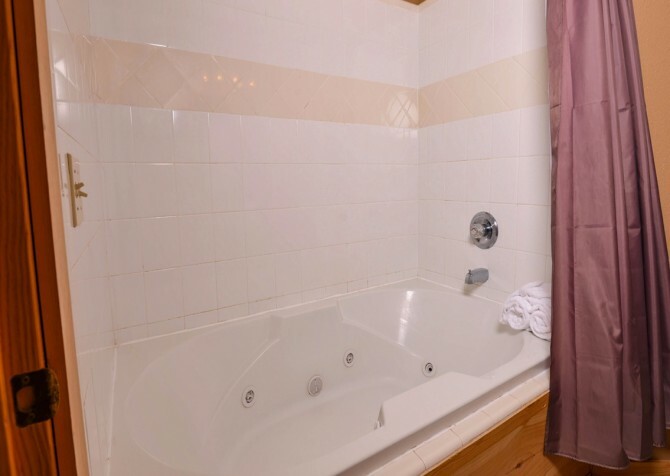 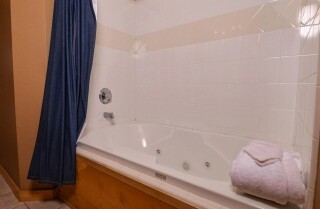 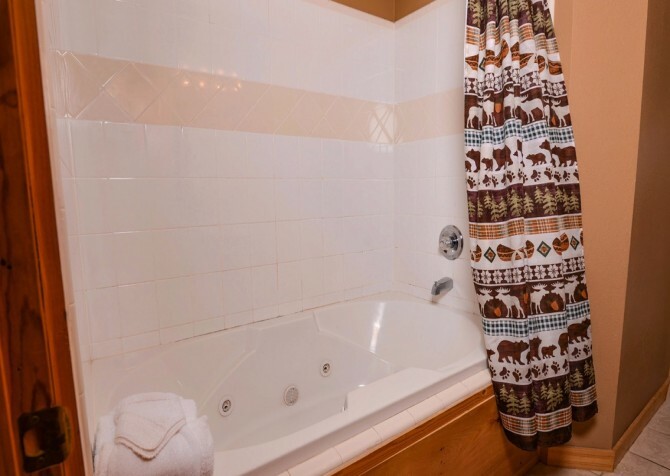 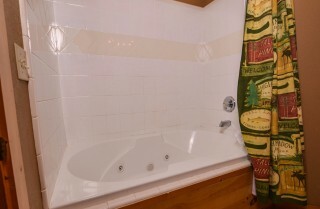 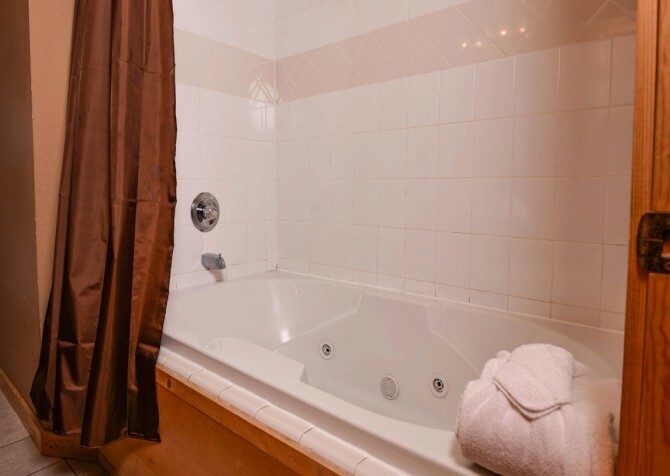 Jetted tubs in all 12 bathrooms, individual flatscreen TVs in every room, and spacious, cozy atmospheres make every guests’ stay an individually rejuvenating experience. 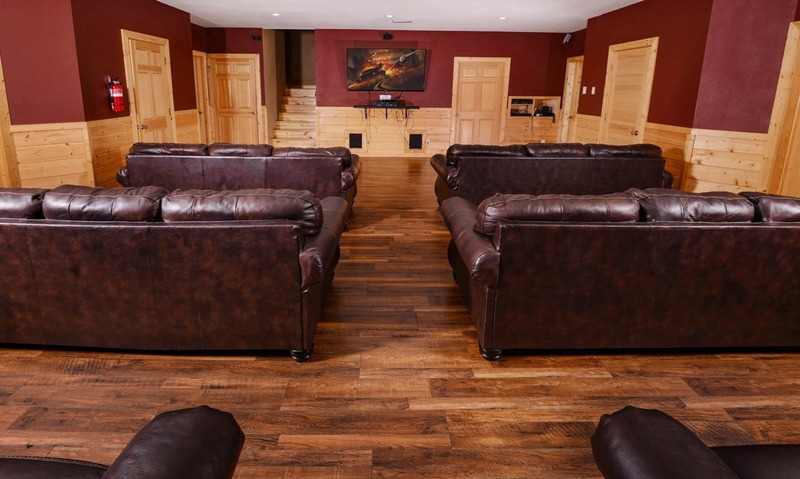 Skip paying movie theater prices for tickets and snacks and host a private screening in your cabin’s spacious theater room! Lounge around on 6 comfy sofas with plenty of space in between to get up for drinks, popcorn, and snacks during the movie. The big screen TV is great for action flicks, and there are even tables in the back of the room where guests can eat or play games during movie night! 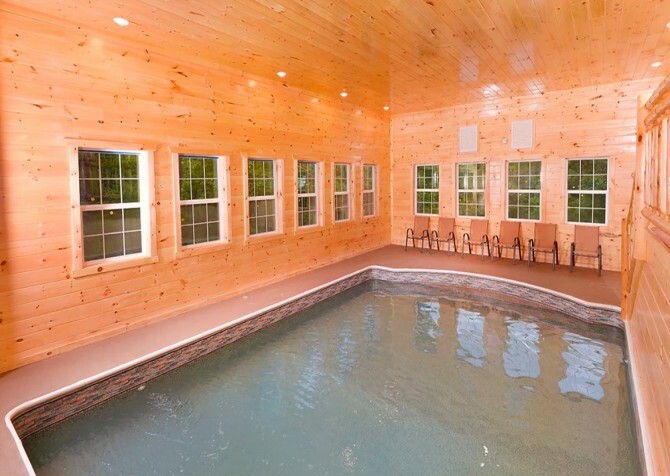 Rain or shine, everyone can enjoy some pool time in the private indoor pool! 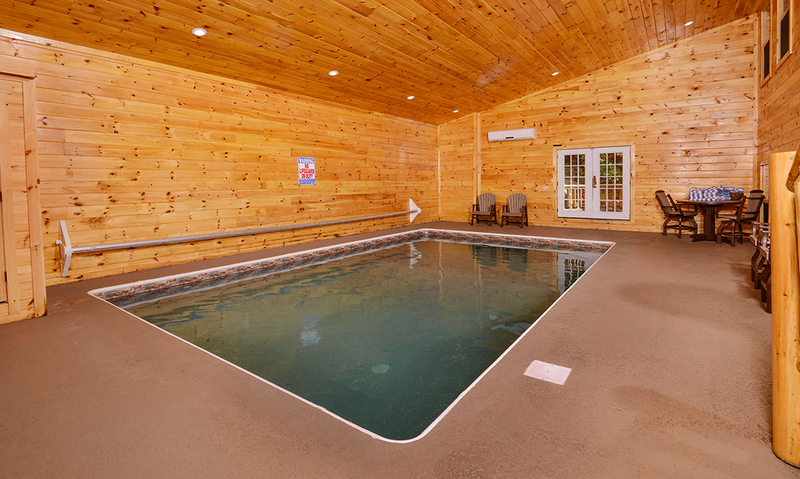 Squeeze in some morning laps to keep up with your fitness routine even while on vacation. 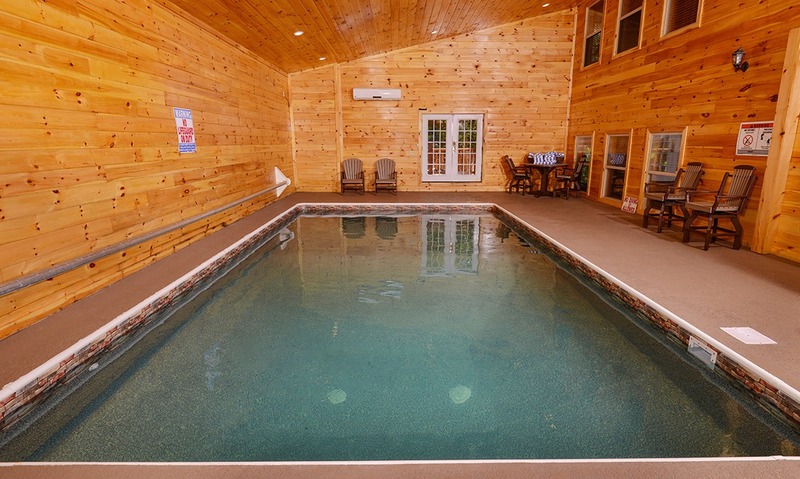 Wade around with little ones, let the kids splash, or just sit back in the chairs around the room with a drink while watching everyone else swim around. 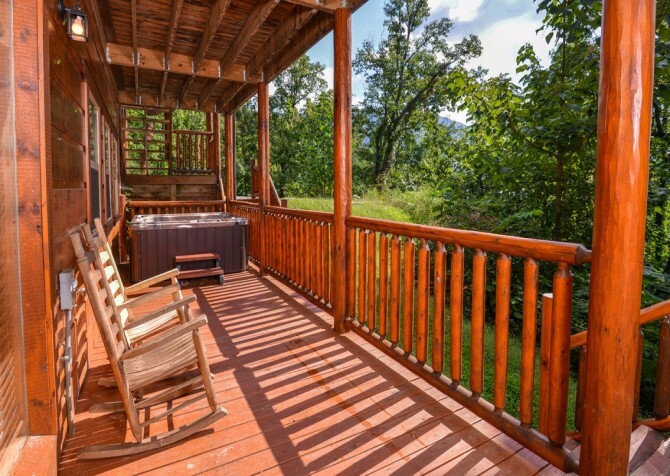 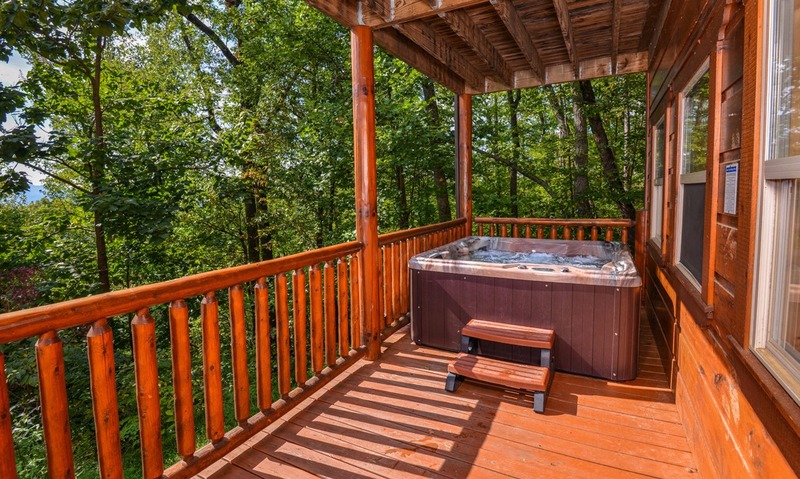 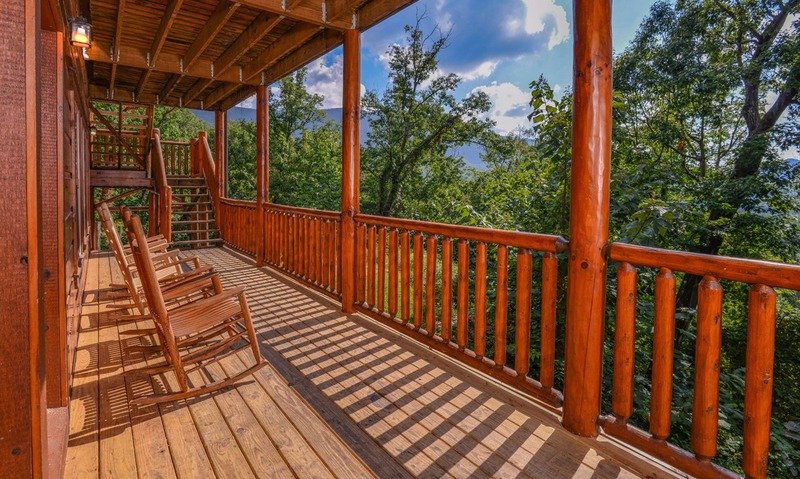 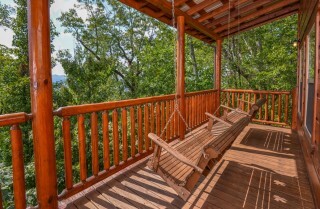 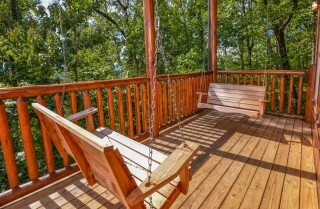 Across 3 cabin decks, guests will love taking deep breaths of crisp mountain air while gazing across serenely beautiful Smoky Mountain forestry. Grab your morning coffee from the kitchen to sip slowly swaying in your wooden rocking chair and watching the sunlight peek through the trees. Soothe tired muscles and feet in one of two outdoor hot tubs after your group shopping trip to the outlets of Pigeon Forge. 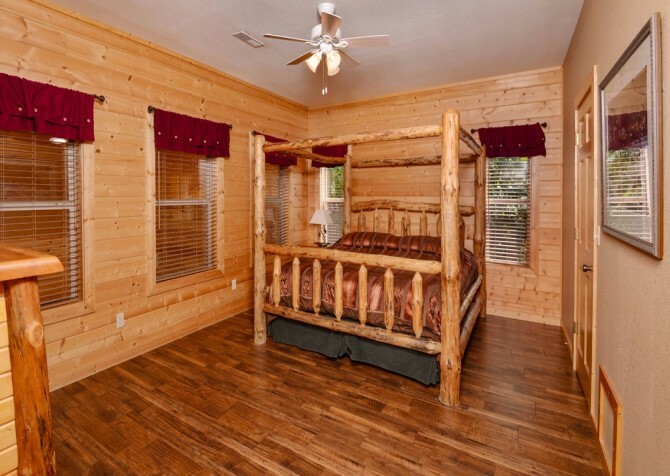 Here for a couples’ retreat? Enjoy romantic moments on the porch swing as you soak up heart-stirring mountain views or sway beneath the expansive night sky. 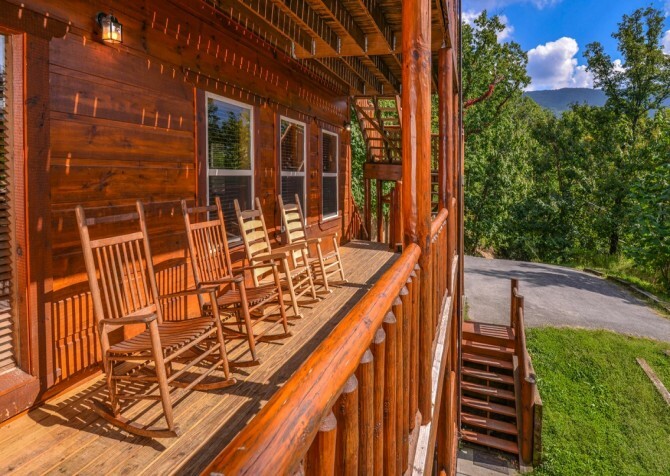 Take your youth group for a scenic bike ride through the beautiful mountain valley of Cades Cove for the perfect budget-friendly outdoor excursion in the Smokies! Or tour the 11-mile loop as a family during the holidays for one of the best photo backdrops in the area. Cades Cove continues to be one of the Great Smoky Mountains National Park’s most visited locations with rolling green hills, restored historical structures, peaceful native wildlife viewing, and majestic mountains resting beyond the tree lines. River life goes hand in hand with mountain living! 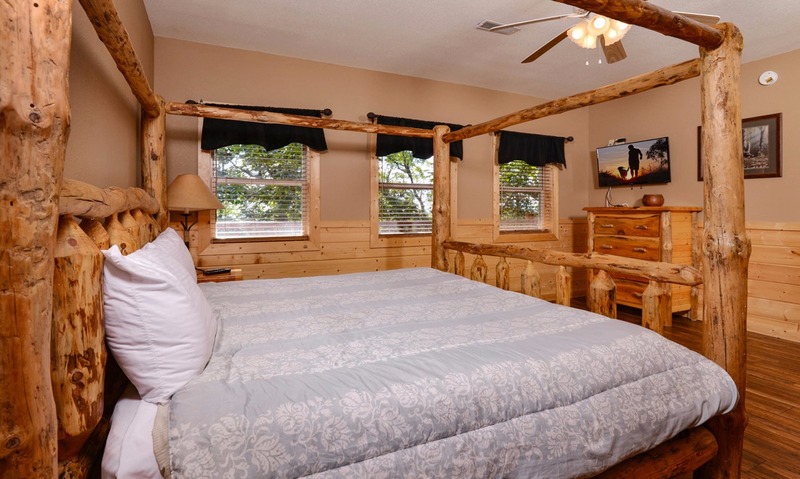 Take on the class III and IV rapids of the Pigeon River in a whitewater raft while fostering teamwork on your excursion along the currents. 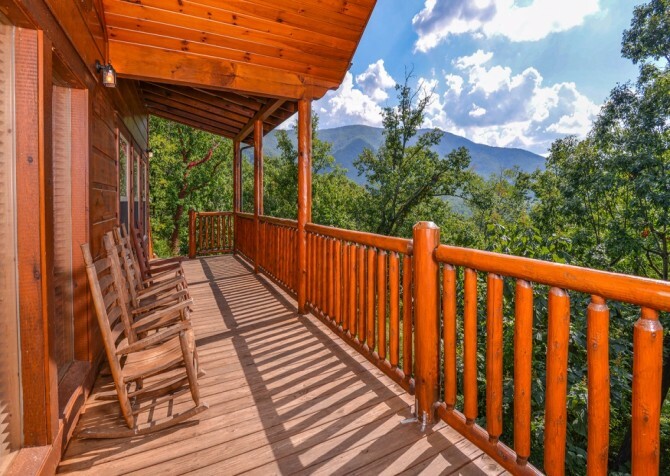 The adrenaline and the scenery make for an amazing and thrilling ride that is sure to be some of your favorite moments while staying in the Smoky Mountains. Another great group activity, rafting through the Smokies is also a great way to take in the breathtaking sights. The Island has everything you could want in a vacation – all in one place – which makes it a perfect stop for families with different tastes in fun! Peruse the unique shops, try Chicago-style popcorn, and try to break out at The Escape Game. 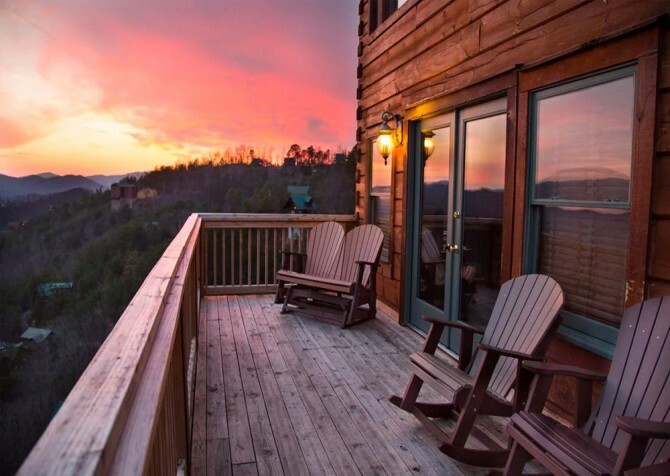 Enjoy delicious meals or savory snacks at the variety of eateries, ride the Great Smoky Mountain Wheel overlooking the city, or enjoy a unique light show by the fountain at the center of the park. 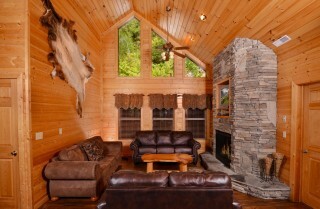 "I booked a the Buckskin Lodge cabin through Cabins for You for a large group and it was perfect. The booking was so easy and the agent Becki was so helpful and easy to work with. 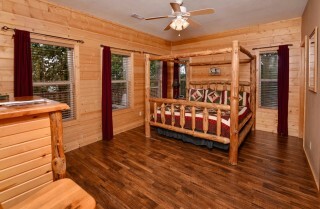 The cabin was better than described on the website. 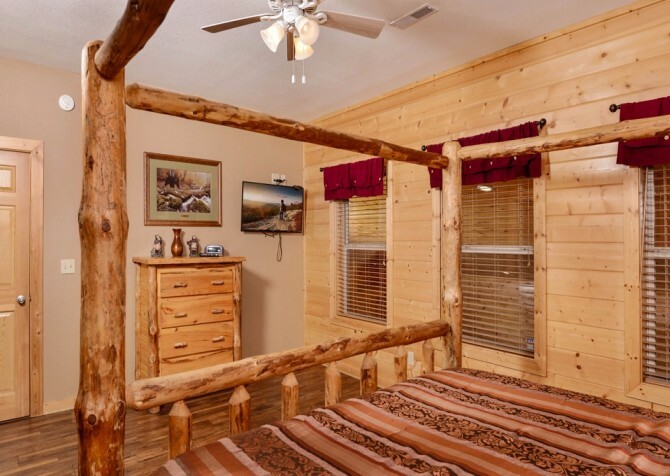 I would definitely book through them again."